On entering the villa there is a circular driveway with a large water feature in the center. The spacious living room is on the ground floor which features large windows which overlook the gardens and swimming pool. The living room features large comfortable sofas, a dining table and antique interior items which were carefully chosen by the owners. A guest bathroom is located on the same floor along with a fully equipped modern kitchen which has a large refrigerator, freezer, oven, cook-top and microwave. The air-conditioned master bedroom is located off the living room and features a four-poster king sized bed with mosquito net, safe deposit box, satellite television, walk in cupboard, a stunning en-suite bathroom, a beautiful natural stone bathtub, a double stone vanity and a separate shower. Access through a doorway leads you to a private garden with an over-sized terrazzo bathtub surrounded by lush tropical plantation. Relax in the tub or lay back on the hammock which is the perfect place for an afternoon rest. The 2nd bedroom is also situated on the ground floor. This bedroom features two single beds which can easily be converted to a double bed, walk-in cupboard and a private bathroom en-suite with standing shower. The en-suite is made from natural materials. A large staircase leads to the 2nd level where a large desk is positioned and two additional bedrooms. All bedrooms in the villa are air-conditioned with private en-suite bathrooms. 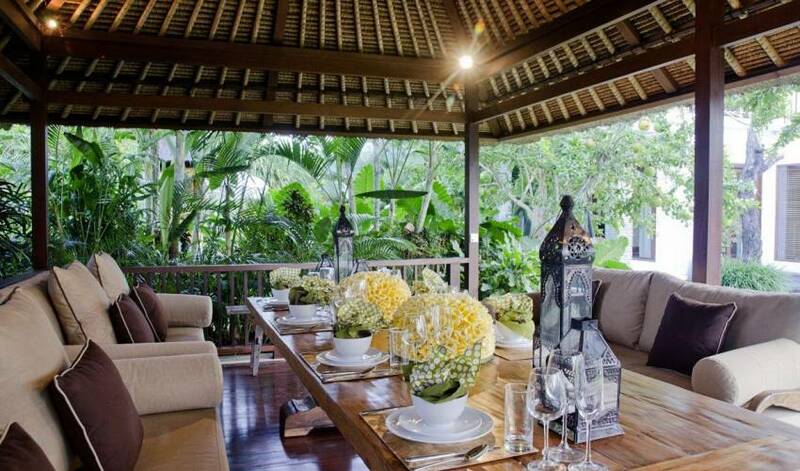 Upstairs there is access to a large balcony which boasts some beautiful views of Bali and the villa lawn and gardens. The balcony has natural stone stools and a glass-top table. 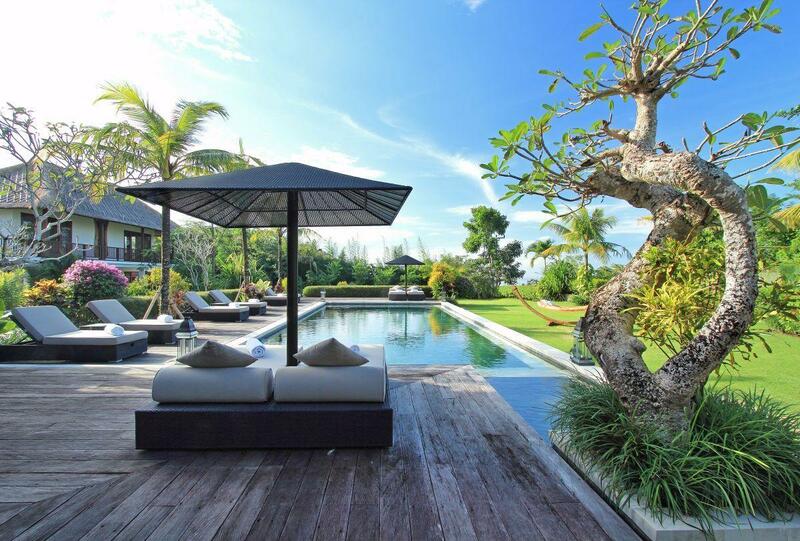 There are various areas in the villa to relax. 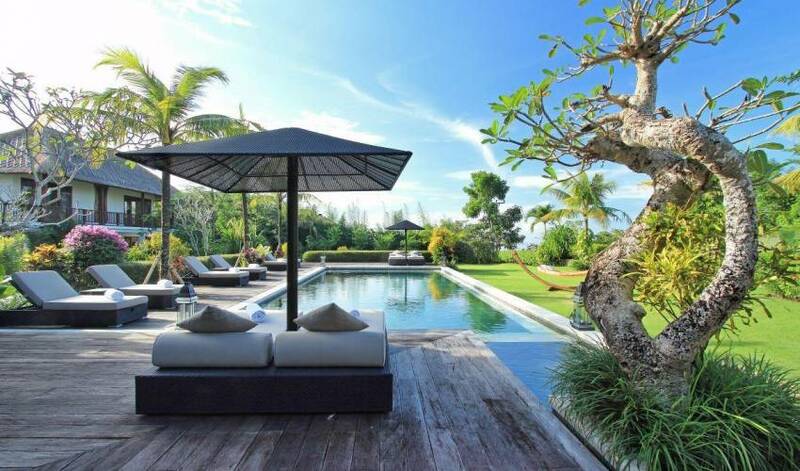 The fresh water swimming pool which is 6m x 14m is surrounded by a square dark wooden decking which is accompanied by some large wicker day loungers and umbrellas. 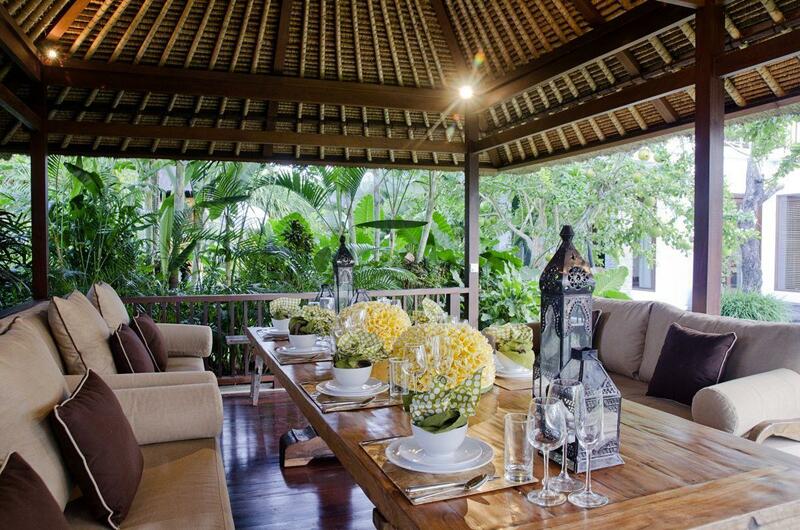 The landscaped gardens and frangipani trees have been perfectly designed which compliment the villa. 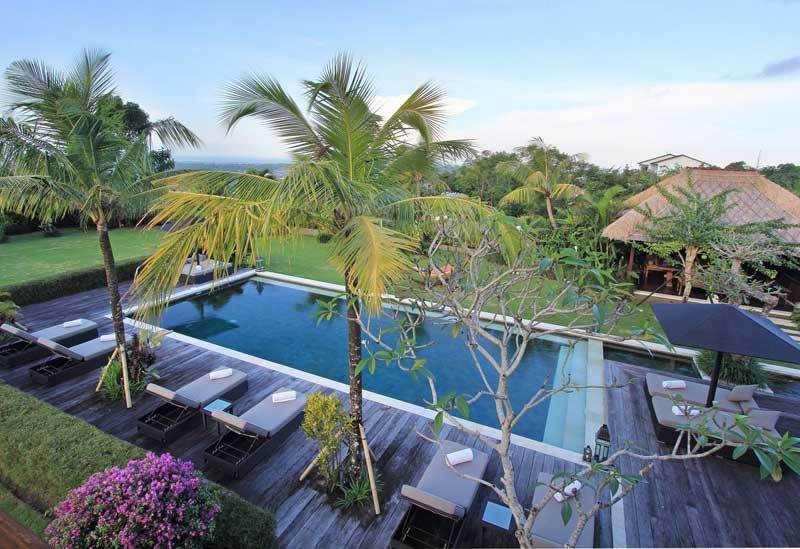 Across stepping stones to the right of the swimming pool is a separate open-air dining and living pavilion with a natural alang-alang roof. The dining table is made from solid wood with comfortable seating perfect for meals with family and friends. To the left of the property is a separate two-storey guest house. Upstairs on the 2nd level there are two additional bedrooms, bathroom en-suites with standing showers. The building also features a long balcony which offers uninterrupted views. Downstairs is an exclusive media room featuring a plasma television, DVD player, surround sound system, comfortable sofas and an American full sized pool table. The villa features a selection of games and books for guests to enjoy. 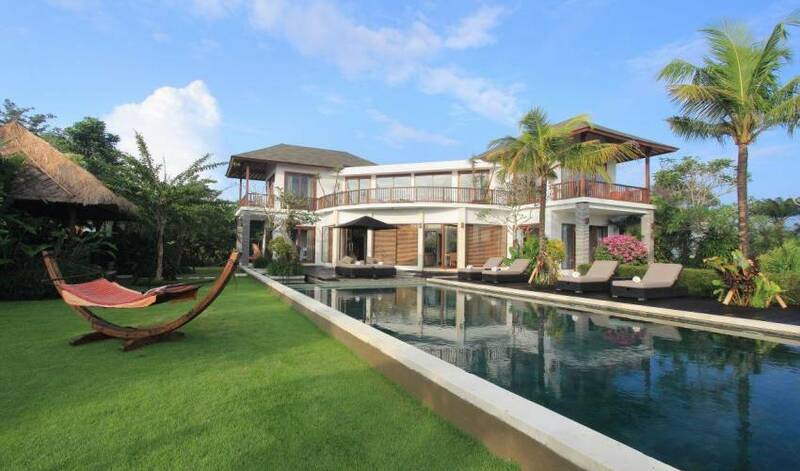 The villa is also designed with another air-conditioned bedroom which has been converted to a spa area. Balinese massages are available on request or indulge with an in-villa spa treatment where a menu is provided at affordable prices. 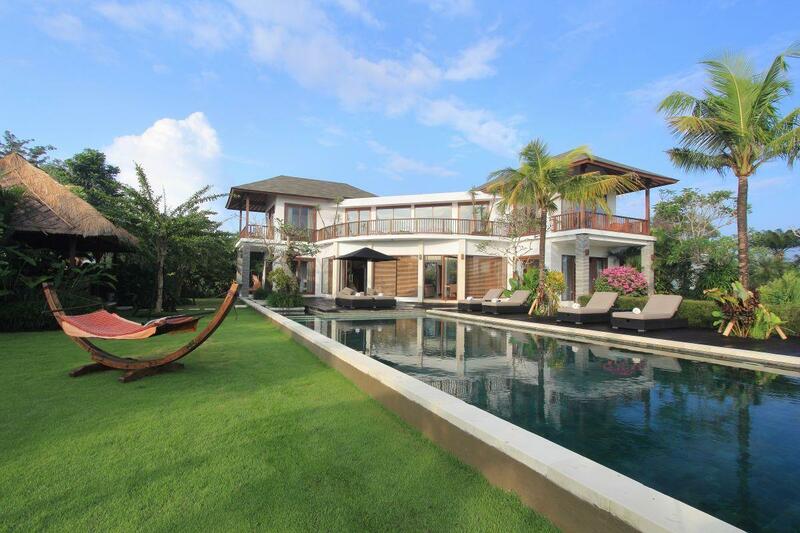 The villa is surrounded by manicured lawns perfect for that special event. The owners have added many facilities so guests are entertained including a full size petanque pitch at the bottom of the garden. 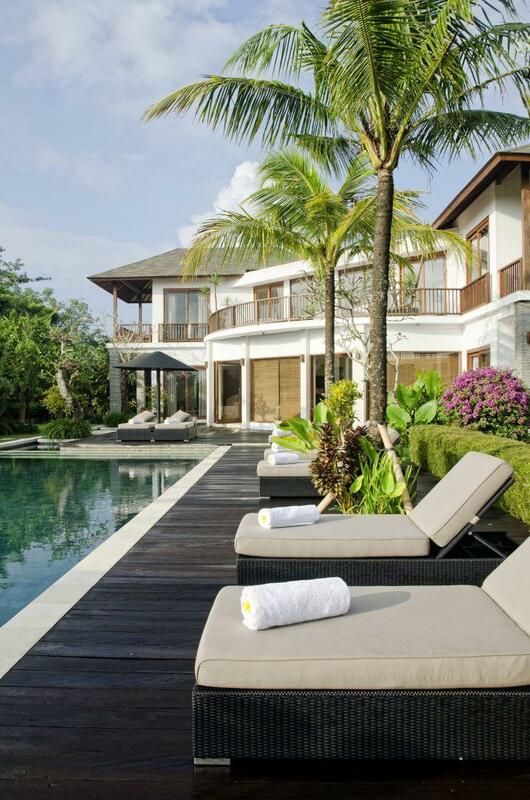 The villa is fully staffed with trained housekeepers, a private cook, three security guards and a site manager. Additional facilities include: Telephone for local calls, wireless internet, satellite television, DVD player, surround sound system, safe deposit boxes, a selection of toys for children, a croquet set, 24 hour security and fully trained staff. 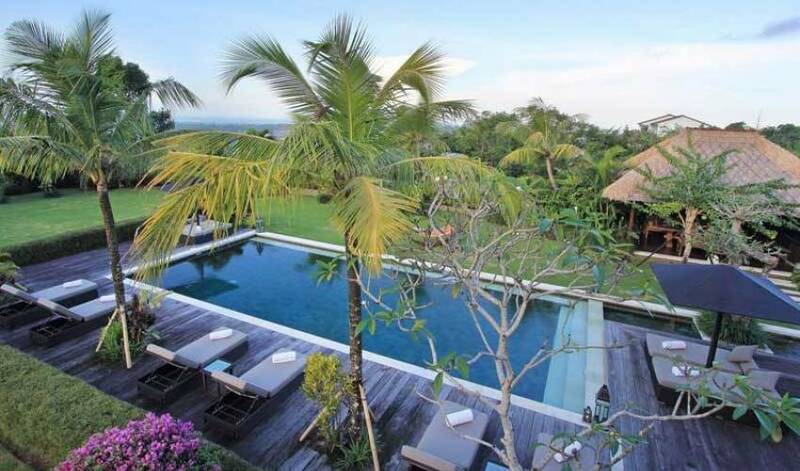 The villa can comfortably accommodate up to 10 people and is the ideal hideaway with luxurious surroundings and views - a true Balinese experience awaits you.